Given below are the several amendments relating to Tax Deducted at Source (TDS) and Tax Collected at Source (TCS) that have been proposed in Budget 2015-16. Currently, the person responsible for paying salary has to depend upon the evidence/ particulars furnished by the employee in respect of deductions, exemptions and set-off of loss claimed. There is neither any guidance regarding the nature of evidence/particulars to be obtained nor any uniformity in this regard. With a view to rationalise the collection of information and documents by employers, a new sub-Section (2C) is proposed to be introduced in Section 192 to provide that the person responsible for paying salary to an employee will be required to obtain evidence or proof or particulars of prescribed claims including claim for set-off of loss under the provisions of the Act in the prescribed form and manner. This amendment is effective from 1st June 2015. When an employee participating in a Recognised Provident Fund (RPF) withdraws the accumulated balance lying to her/his credit in the said RPF account, that amount is not included in her/his total income and is considered as exempt provided certain conditions are met. The main condition is that such a person should have rendered continuous service with that employer for a period of five years or more. In case of cessation of employment, if the employee takes up an employment with another employer and the accumulated balance in her/his RPF account is transferred to her/his RPF account maintained by such other employer, then also the exemption would be available. It therefore follows that if the abovementioned conditions are not satisfied, the accumulated balance due to the employee is taxable in the hands of the employee. In such a case, tax is required to be calculated by re-computing the tax liability of the years for which the contribution to RPF has been made, by treating the same as contribution to unrecognised provident fund. The trustees of an RPF are required to deduct tax at source on such accumulated balance at the time it is paid, as if such withdrawn amount were income chargeable under the head Salaries. However, often, the trustees did not have the requisite information to be in a position to compute the TDS correctly. With a view to simplify the process of deduction in such cases, Section 192A is now inserted to provide that trustees of RPFs shall, at the time of payment of the accumulated balance due to the employee, deduct tax at source at the rate of 10%, where the aggregate withdrawal is Rs. 30,000/- or more. At the same time, if the concerned employee fails to furnish her/his permanent account number (PAN) to the person responsible for deducting such tax, then tax shall be deducted at the maximum marginal rate as per Section 206AA. It has also been provided that tax shall not be deducted if the employee furnishes to the payer a self-declaration in the prescribed Form No. 15G/15H, declaring that the tax on her/his estimated total income of the relevant previous year would be nil. All these amendments shall take effect from 1st June 2015. There are several amendments pertaining to TDS from interest. Interest on fixed deposits with banks attracts TDS under Section 194A. Only exception to this was in respect of interest paid by co-operative banks to their members. Now, Section 194A(3)(v) has been amended to expressly provide that payment of interest on time deposits by a cooperative bank to its members will not be exempt from withholding tax requirement. Therefore, with effect from 1st June 2015, when interest paid or credited in excess of the prescribed limit (which is presently Rs. 10,000/-), tax will have to be deducted at source by the cooperative bank. The existing provisions that permit a depositor to furnish Form 15G/15H for non-deduction of tax at source from the interest wherever applicable, will apply to the interest on deposits with cooperative banks also. The exemption from withholding tax under Section 194A(3)(viia)(b) in respect of payment of interest on time deposit taken from a cooperative society will continue to be available to a cooperative bank. Similarly, a primary agricultural society or a primary credit society or a cooperative land mortgage bank or a cooperative land development bank shall continue to enjoy the exemption under Section 194A(viia)(a), and will accordingly not be required to deduct tax at source from interest payment. The definition of the term time deposits under Explanation 1 to Section 194A(3) has been amended to include recurring deposits within its scope. As a result, now for all banks, whether cooperative or commercial, interest paid on both time deposits and recurring deposits will attract the TDS provisions. Many bank depositors avoided TDS from interest on bank fixed deposits by splitting their deposits amongst different branches of the same bank. This was on account of the current provision whereby the threshold limit of exemption from TDS is applicable to the interest credited or paid by every branch on an individual basis. With a view to curbing this practice, it is now proposed that TDS under Section 194A will be with reference to income credited or paid by the banks as a whole (in those cases where core banking solutions have been adopted by the concerned bank). Interest paid on compensation amount awarded by the Motor Accident Claim Tribunal has been brought under the ambit of TDS. If the aggregate amount of such a payment during the financial year exceeds Rs. 50,000/-, there will be a TDS at the time of payment of the interest. Consequently, it follows that there would be no requirement to deduct tax at source at the time of credit of interest. 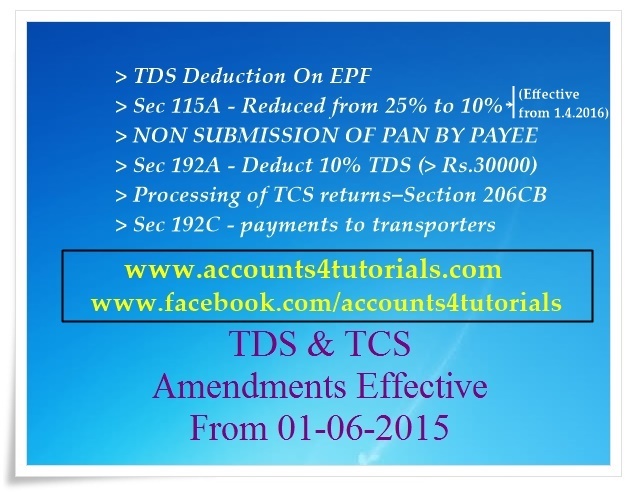 All the above amendments are effective from 1st June 2015. Currently, payment to transporters carrying on the business of plying, hiring, or, leasing of goods carriages is not liable to withholding tax if the transporter furnishes her/his permanent account number to the payer. It seems that the intention of having this provision was to exclude small transporters from the rigours of TDS provisions. But because of the way the section was drafted, all transporters were excluded from the TDS provisions if they had a PAN. With a view to bring back the big transporters back into the TDS fold, from 1st June 2015 onwards, this exemption will be available only to those transporters who own ten or less goods carriages at any time during the previous year. Such a transporter would also need to furnish a declaration to that effect to the payer along with the PAN. There was also some bit of confusion in the minds of a few people as to whether the said section (and exclusion) applied to payers engaged in the business of transport or to payees engaged in the business of transport. To remove this confusion, it has now been clarified in the Memorandum to the Finance Bill that this exemption is available whether such amount is paid by a person engaged in the business of transport or otherwise. At present, any person who is required to deduct tax at source (other than under Section 194IA) is expected to obtain a TAN and quote that TAN in the challan and the TDS statement that he is supposed to file. This is a cumbersome requirement–particularly to the individuals who acquire an immovable property from non-residents. In such cases, for one time transactions also, the TAN related formalities have to be complied with. In order to provide relief to such individuals or Hindu undivided families (HUFs) who are not liable for audit under Section 44AB or for one time transactions such as single transaction of acquisition of immovable property from non-residents on which tax is deductible under Section 195, it is proposed to amend Section 203A to the effect that the requirement of obtaining and quoting of TAN shall not apply to such notified persons. This amendment is effective from 1st June, 2015. A new Section 206CB is proposed to be introduced to facilitate the processing of TCS (tax collected at source) statements on the same lines as TDS statements. Section 206CB(1) permits adjustments to the sums collectible to take care of arithmetical errors or incorrect claims apparent from any information in the TCS statement filed. Interest if any, payable on the sum collectible and fee payable under Section 234E are now chargeable in respect of the TCS. For this purpose, suitable provisions have been introduced in the Sections 200A and 206CB. The intimation has to be sent before the expiry of one year from the end of the financial year in which the statement is filed. Section 206C(7) provides for payment of interest if the person responsible for collecting the tax does not collect the tax or after collecting does not pay it as required under that Section. At the same time, since an intimation generated under Section 206CB is deemed to be a notice of demand under Section 156, interest under Section 220(2) would be payable if the tax collector fails to pay such demand within thirty days of the service of the notice of demand. This could give rise to a situation where interest is charged under both Sections, 220(2) as well as 206C(7). To avoid this, a new sub-Section (2C) is proposed to be inserted in the Section 220 to provide that where interest is charged for any period under Section 206C(7), no interest shall be charged under Section 220(2) of the Act on the same amount for the same period. These amendments are effective from 1st June 2015. Section 194DA provides for deduction of tax at source at the rate of 2% from payments made under a life insurance policy, if such amount is chargeable to tax and the amount is not less than Rs. 1,00,000/-However, there is no facility for such an assessee to file a self-declaration under Section 197A to receive the amount without deduction of tax at source even if she/ he has no tax liability. It is now proposed to amend Section 197A provided that tax shall not be deducted under Section 194DA if the recipient of the payment on which tax is deductible furnishes to the payer a self-declaration in the prescribed Form No. 15G/15H declaring that the tax on his estimated total income for the relevant previous year would be nil. This amendment is effective from 1st June 2015. Presently, interest paid to a foreign institutional investor, qualified foreign investor and foreign portfolio investor on rupee denominated bonds of an Indian company or a Government security is taxed at a concessional rate of 5% plus applicable surcharge and cess. This concession was available for interest payable on or after 1st June 2013 but before 1st July 2015. The concessional rate of tax is proposed to be extended up to 30th June 2017. Presently, when any person responsible for making a payment to a non-resident of any interest or other sum chargeable under the provisions of this Act, such person is required to deduct tax from such payment under Section 195(1). Further, sub-Section (6) of Section 195 requires such person to furnish the information relating to payment of any sum in Form 15CA. In most cases, a view was taken that this provision applied only to payments which gave rise to income chargeable to tax in India. Consequently, payments that did not give rise to income chargeable to tax in India were not reported in the Form 15CA. Now, sub-Section (6) is proposed to be amended to provide for furnishing of information whether or not such remittances are chargeable to tax. This would cast a heavy burden on persons who make payments to non residents–especially in case of import of goods. Even for such payments, now, the obligation to furnish Form 15CA (and also Form 15CB) will have to be complied with. This burden has been further compounded by the proposal to introduce a new Section 271-I to levy a penalty of Rs. 1,00,000/- if the person required to furnish information under Section 195 fails to furnish such information or furnishes inaccurate information. This amendment is effective from 1st June 2015.